Coming into their third match with the Atlanta Thrashers this season, the Rangers and Atlanta were two teams going in different directions. The Rangers were a quiet 7-1-2 in their last 10 games while Atlanta was struggling in the midst of a 9 game winless streak. As the puck hit the ice, the Rangers were 17-0-1 when they led going into the 3rd period while Atlanta was 0-14-2 when trailing after 2 periods. Needless to say, all these trends were broken as Atlanta rallied from a 1-0 deficit in the third and ultimately prevailed after 5 shootout rounds, 2-1. Official game recap is here. 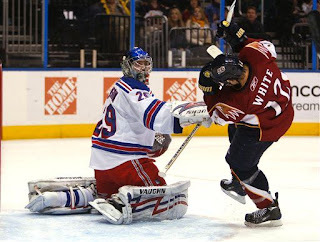 This game portended to be and played out like so many other road games that we have seen over the past couple of seasons where the Ranger back-up goalie opened the game. For the first 2 periods, he played well, the Rangers defense kept opponents off the scoreboard and the offense gave the team a 1 goal lead going into the final period. Then comes the third period and we watch open-jawed in horror as the roof caves in, when the offense disappears and the defense becomes more porous than the NY Football Giants secondary leading to a rout for the hosts. We have seen it in Toronto, Dallas, Uniondale and Pittsburgh over the past couple of seasons to name the ones that come to mind immediately. Steve Valiquette's own third period meltdowns in these games are the primary reason he now is backstopping the Wolfpack. shut down Atlanta. I saw more snow in Scarface. So trying to avoid a repeat of history, Atlanta was the destination for the debut of Chad Johnson as a starting goalie against the struggling Thrashers. Adding to the dramatic setting was the plight of Atlanta -- a metropolis being shut down faster than Jets CB Darrelle Revis clamping down on football's Chad Johnson in the face of the horrific effect of a devastating Thursday afternoon snowstorm that shut down the city and schools for Friday and led to less than 50% attendance at the game with the Rangers. BTW, anyone notice that only an inch of snow induced the panic? The game followed the usual script -- during the first 2 periods, Chad Johnson never wilted under steady pressure from the hosts and did his level best to maintain a 1-0 lead provided by Enver Lisin. He even assisted on that goal. He responded well to the non-stop pressure of a Thrasher power play in the first that was relentless in launching shots from all directions. He showed great quickness in moving from one side to the other in denying two point-blank opportunities in the crease by Peverley and Jimmy Slater. mere 10 seconds after the power play expired with 2:39 gone in the 2nd. Johnson was superb turning aside 24 shots in the first two periods. In the 2nd period, he stopped Slater on a 2 on 1 shorthanded opportunity and then stoned Evander Kane on another one. The Rangers defense was focused and did some good work clearing the crease and Marc Staal cleared a puck that eluded Johnson before it crossed the goal line. Kane disabled by Johnson in the 2nd. Watching Johnson's confidence and economy of movement, I started to feel hopeful (not confident) that the Blueshirts might add another win to their recent streak and Johnson might have a shutout in his first game as starter. But just like old times with Steve Valiquette, the 3rd period was a bit of a different story. Chad continued to excel but you noticed (just like the other Valiquette games), the offense disappeared and the defense started to fade. better recently lost its footing against Atlanta. 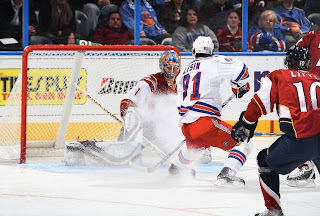 The Thrashers started to break through the defense more frequently and get better scoring opportunities. Johnson continued to repel their efforts. Meanwhile, Rangers were missing the few opportunities that presented themselves. Ultimately, despite his overall great recent play on the penalty kill, Brian Boyle was undressed of the puck at the center red line by Pavel Urbina who found Jimmy Slater streaking across the blue line. After receiving a beautiful feed in stride, Slater moved in on Johnson splitting 3 defenders and beat Johnson between the pads with a quick move. Jimmy Slater gives thanks to Urbina for the assist. stick to deflect not only pucks but also opponents. Still, Johnson never wilted and did not give up the deciding goal either in the final 14 minutes of the game or in overtime. In all, he made 31 saves during the game. Of course, the skill competition followed and for the 2nd time this season, the Rangers succumbed in the shootout after 5 rounds by the score 2-1, which matched the final score of the game. So now the Rangers are 0-1-2 this season against Atlanta and Thrtasher goalie Johan Hedberg is 3-0 this season. The Rangers travel to Boston for a Saturday matinee. They started this week with their stirring 3-2 victory on Monday night against the Bruins at MSG. They have garnered points in 10 of their last 11 games and have caught Ottawa for 6th place in the Eastern Conference. Based on how much noise there was during the Rangers' slump in December including the public benching of Wade Redden, it's interesting to see how much better the Rangers have been playing and yet the fans have been very quiet. It will take a while for skeptical fans to have faith in this team that its recent play is not a mirage like the first 10 games of the season. A couple of things have been fairly consistent over the past few weeks (except for a couple of real bombs) -- the PK and goaltending. Those have been the reasons the Rangers are in most of their games. The recent increased scoring and the distribution of goals have been critical to the Rangers' improved record. While getting a victory would have been nice, at least the Rangers got a point on the road and gave Henrik Lundqvist a much-needed night off. It's not worth complaining during a 7-1-3 stretch. 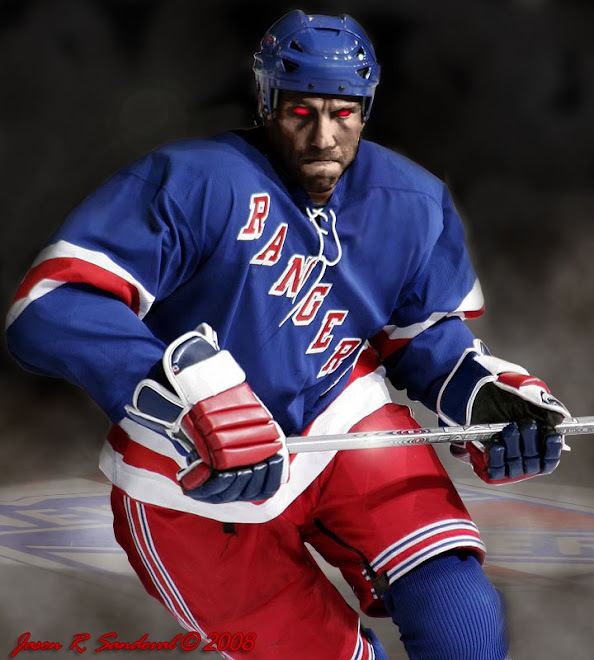 Let's go Rangers, lets go! Great blog you have here. I have a blog myself that solely focuses on the New York Giants. We should exchange links to spread some traffic around between each other. Let me know if this is possible.